As one of the best toy company In world,Lego has made many sets that blow our mind,like the 10188 Death Star,10179 UCS Millenium Falcon,and more.But is that the best Lego can do?What Lego sets ( or theme)that you wish to be happen?Post your answers here according to your favour. For me,I hope that Lego can make they own Lego Transformers set,but sadly it's impossible. If I were to sell minifigures based off a theme I would make the Ninjago minifigure Collection Series but not the minifigures from the movie as we all know today I'm talking about the T.V. series and they are based off the Ninja suits from the show they can be seen in the Gallery of Ninjago.com for the Gi Exhibit I posted a few pictures of them on my twitter page. After the happiness of getting 18th in the Wacky wheels contest, i decided to share my most recent project. If you haven't already figured it out, I love mini loaders. That is why i am now presenting my 3rd mini loader on this site. I mostly love them because i had the opportunity to drive a Cat 297c (and a bulldozer) at 13, and he said i drove it perfectly. It had a fork attachment when i drove it, so I put forks on this to honor that (I lifted part of flatbed a truck with it). skid steer, independent wheels. cockpit (seat + controls) self leveling boom (standard linkage.) place for removable attachments (more later) forks. I ended up spending 10$ on the wheels for this (+ the telehandler), and they look great. leveling linkage. Please drop a comment, and thanks for looking. Btw @Jim, if you put a rank on my profile, make it something to do with mini loaders please. Hello everybody i made first movie wiht legos stopmotion please watch the movie :) thanks for watching. Okay this is another free build, I've made, my second actually, so I hope you all like it! Here it is: Deep in the swamplands of Nocturnus, was a treehouse built from two trees. The treehouse over looked small road used only by a few merchants who wished to shave time off their trade route. Inside were two croc warriors. Suddenly running up the road was a third croc warrior. He ran over to the tree house and scrambled up the ladder. “What is it?” Demanded the leader of the croc warriors. “A merchant wagon is coming! Two guards! They’ll be here ANY minute!” “Finally! Get to your posts!” barked the leader. The other two warriors scrambled down the ladder and concealed themselves in the swamp. The crocs watched silently as the wagon came nearer. Just as it passed the tree house the leader croc dropped a log held by who chains, it swung through the hole in the tree house floor and slammed into the wagon knocking it and the guard walking next to it into the swamp. The crocs in the swamp leapt out and attacked! The leader scrambled down the ladder and attacked the last guard, quickly killing him. Soon all the merchants were dead, and the crocs set about looting the half submerged wagon. Okay that's it hope you all liked it! Please feel free to leave any compliments and/or criticism. Does anyone have an idea for at cool version of LaFerrari from Ferrari? If so please share your ideas :) HUGE ferrari fan. This is a MOC I have made based off of the steiger line of tractors. I have decided to put this project on Lego Ideas, and was hoping many you could support it. I am striving for this to become a Lego set. I do understand that there is less of a chance for this to become a Lego set because it is Technic. I would appreciate no negative comments about this Technic creation being on Lego ideas. Only constructive criticism please. If you could share this around, or just support it. Every supporter counts! Here are a few pictures of the model: Link: https://ideas.lego.com/projects/114366 This MOC functions include: Lights All wheel drive Articulated steering Working steering wheel Openable hood to reveal a in-line 6 engine Working PTO A VIdeo of the Tractor: Thanks for the comments and support! Custom Lego tattoo shop ! DSC_0189 by exactoy, on Flickr https://www.flickr.com/photos/130450019@N05/? Hello all! I was browsing YouTube and found this awesome creation Copied from description: A technic pin sorting machine using compressed air for ejecting pins The pins are feed from the tumbler one by one and dropped on a fast moving conveyor. This ensures a minimum distance between the pins. Next they pass a color senor which measures the color, shape and length of the pin. These measurements are compared to the profiles of all types of pins and scored by similarity. The matching profile gives which output to activated and when to do it. Pins that don't pass the similarity threshold are ignored and drops in the container at the end of the conveyor. If only them made instructions so blakbird can review it NOTE: this is not mine! I apologize this isn't in real bricks yet, but I promise it will happen as soon as I can do it. This is a mod of the truck from the just-released 60085. I've been wanting to do a bro-tractor style truck for quite a while and gathered up tons of references to do my own design, but I felt this platform was just right to mod from. Here it is: Features include massive investment in forward-facing light apparati, sweet paint job, chromed-out front clip (to be special-ordered for the Real Thing! ), janky front lift... ...False stacks in the bed (and Real Exhaust under the chassis), multiple sets of lift blocks above the rear axle, aftermarket tail lights and tailgate illumination strip... ...Retained gooseneck hitch, plus plenty of room for, uh, energy drinks... ...and an epic drop hitch that I am very proud of (and some weird green berries). I was going to create the minifig piecemeal, but I may as well just put the standard-issue Rapper minus his mic in the cockpit. (though the windsurfing print does look more appropriate than the chain) Enjoy, and stay tuned for the Real Thing as soon as I can afford to build it. Hello! This is my first ever post here. I have recently started getting back into Lego - my childhood pile was donated a few years ago (but for a few vintage printed pieces and chewed-up 1x4 plates that I saved). 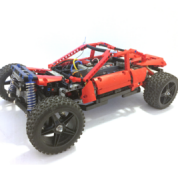 This project mostly came about because I wanted to build a Lego version of my beloved truck, a 2010 Nissan Xterra, which I have heavily modified: I have done all of the modifications myself, including fabricating many of my own parts (I'm a welder). We'll come back to this in a moment :) For those of you not in the western hemisphere or a market where the Xterra is sold, the Nissan Xterra is a 4x4 SUV based on the Nissan Frontier/Navara platform, designed and primarily built in the US. My first attempt at a Lego Xterra was a modification of 4433 Dirt Bike Transporter; you can see the results of it on MOCPages here. I decided to make it a police truck, mostly because I wanted an excuse to buy some BrickArms weapons. The first major revision of this model saw bigger tires with working suspension, along with a lot of fine-tuning in the bodywork: See more here. I was pretty happy with this one, and then decided to order parts to build a model of the actual truck I own. This version features representations of the stock bumper and tires I had at the time, as well as the rear hatch ladder. Its latest revision has a better roof fairing, as well as the mud-terrain tires, custom-painted rims (and yes, I committed the cardinal sin of painting Lego to match), and tire carrier: See more here. I could help but build one more, this time inspired by the City Elite Police: See more here. And I pretty much left that there for most of the year. I bought a few sets in between to help flesh out my off-road vehicle collection, but I had an itch to do something unique. I thought about making a version of the Mercedes Ener-G-Force concept, then about a civilian SUV version of the SHIELD truck from 6867. I pursued the latter option and it evolved into a concept Xterra that I call the X3 "Super Xterra": See more here. This MOC has all the bells and whistles I could think to put on an off-road SUV - live axles front and rear with differential detail (both articulate as you can see), hidden winch inside the front bumper, which also has a prerunner stinger bar, built-in lighting all around, intake snorkel. Here it is compared to the previous version (latest revision): And that's a custom decal for my face. I'm sure I'll be pushing them as I discover better elements (or Lego comes up with better ones - I need a windscreen with much more rake!). I have a few other MOCs, of course, which will be showing up in due time, but I thought I'd kick off my membership with a doozy. Hey everyone. I've submitted a design on Threadless with a Lego minifig with its head attached to its leg, with the text saying 'This...is NOT funny'. I will be the happiest man on the planet if you have time to go vote for my design. Threadless will each week review the submitted designs and pick the favorites among the community. This will give me the chance to earn some money, and you could end up wearing my print. So go visit https://www.threadle...gns/exasperated and you will become...awesome. (You will have to log in before you can give a score, but you can easily do that with your facebook account.) And remember to spread the word. From the bottom of my heart... Thank you. Hello lego fans who are also fans of call of duty. I made a 2-part series revealing custom figures I have made who are dedicated to the game. I would like for the world to see these customs because I know many lego fans will adore them. Here are the videos: Tell me what you think! Hello, I made a real-life replication of this weapon, which can be found in the famous FPS Call of Duty Black Ops 2 [removed link] Please tell me what you think! I am a Black Ops fan and I love replicating lego guns from the game. Here are some I made: [removed link] You can also check out the PDW-R [removed link] Please share your opinion on them! Do you want to own functional, durable, handsome and unique lego versions of real-life guns? Than you will be interested in Lego Gun Instructions! Link removed [Edit by WhiteFang] Find us on eBay! If you order for more than $5.00 you get 1 pistol instructions for FREE! Behold, six-wide steering based on Mixels joints! I am upgrading my fleet of Lego Xterras with this neat technique that I thought up early last week. For more info, see them here: http://www.eurobrick...topic=90846&hl= So, it's pretty straightforward: Technic friction ball/pin connector and Mixels 1x2 socket plates. On the Super Xterra, retaining the solid axle articulation! See below. On the regular Xterra, which is based on the Great Vehicle build style, there's much less room to move and the effect is very subtle. The joints have enough friction to stay wherever they're set. Again, subtle effect with a semi-standard City build due to lack of clearance, but it can steer! Utilizing the other axis, the Mixel joints coupled with the solid axle in the rear give a pretty convincing impression of independent suspension. The steering effect really shines when your vehicle is lifted to the heavens: Somebody needs an alignment! Oh dear. (another very convincing independent suspension effect :p) And coupled with some extra articulation... The one downside I've found is that, due to the friciton pins, the articulated wheels don't spin very freely (though it's advantageous for posing). Enjoy, and spread the word! I think the Swamp Police SUV in 60068 is one of the best out-of-the-box minifig scale offroad vehicles Lego has ever designed, looks-wise. It's a marriage of a Land Rover Defender and Dodge Ram with a lifted Jeep's proportions. I took the design and pushed it just a little more. I was inspired by the US Forest Service's and Border Patrol's paint schemes, as well as then open-sides look of the Jeep Wrangler Hardtop Concept: My mod is probably 95% similar to the original model. The front end has been played with, giving it a contemporary LED-style light bar in place of the original model's four round lights, and a winch in place of the original bumper's tow hook. The headlights and grille are more generic (or perhaps closer to classic Nissan/Suzuki shapes). Aside from the obvious replacement of the rear windows, the rear is identical to the original build. The roof rack was an interesting sketch that plays out beautifully. I will be making this for real at some point soon, I have near total confidence that all the dark green elements exist. I'm torn on which windshield to use though. Any thoughts?